Each year, the DRC produces more than 200 events featuring rich and timely content relevant to the business community we serve. DRC events also provide an opportunity for companies to engage with key business leaders, policy officials, and other influential decision makers to help raise your profile and grow your business for years to come. 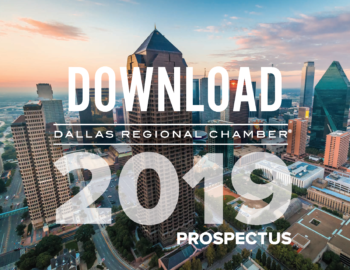 Our 2019 programming and live events will once again feature a lineup of distinguished keynotes, guest speakers, and expert panelists to address the critical issues that impact our business climate and quality of life in the Dallas Region. We’ve created a 2019 Prospectus of our annual events and programming to give members and investors the chance to identify sponsorship opportunities that align with the audiences and topics that matter most to you in support of your business objectives. We can also create a tailored plan to meet your specific needs and ensure a year-round return on investment. To learn more about sponsorship opportunities or to create a customized approach to meet your specific needs, please contact sponsorship@dallaschamber.org.